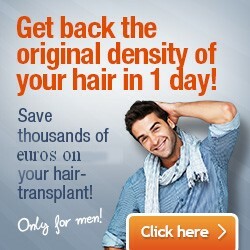 There are millions of men (and women) who suffer from hair loss. Some of us feel embarrassed, it damages our confidence and make us look older than we really are. There are different causes of hair loss which includes illness, diseases, medications, and hormone changes, but also usually injuries and alopecia which can cause permanent hair loss. There are different solutions for permanent hair loss and understanding the procedure of each of them as well as their effectiveness in the treatment can help you determine which one is right for your case. There are medications that can stop hair loss by reversing hair follicle shrinkage, as well as, help regrow hair. These are lotions that are applied to the scalp on the balding areas. They contain a potent DHT inhibitor. This high concentrated liquid, Rogaine, applied a few times a day have been proven to block Dihydrotestostrone, which causes hair loss. Propecia is another medication but in pill form. It too, inhibits DHT, which causes hair to shed, miniaturizes hair follicles, and eventually leads to hair loss. Clinical trials for Propecia showed that in 80 percent of the test cases, hair loss was stopped, additionally, in 64 percent of the cases hair regrew. Laser therapy is a low-level laser light treatment that used to force new hair growth. The light is used to stimulate hair follicles in the affected areas by increasing protein production and metabolism. Most patients are put on a hair restoration treatment schedule which would consist of having two or three half-hour sessions per week for eight weeks, then once a week for sixteen weeks. Follow-up sessions would also be recommended which would be two sessions per month for approx. six months then quarterly maintenance treatments. Follicular Unit Extraction or FUE, is the leading treatment for hair loss with the best and more natural results. In this treatment process, hair is removed from one area (donor area) to the affected area. An instrument harvests donor hair by making a small incision on the skin around the follicle unit separating it from its surrounding tissue. This graft is then placed with an instrument into the balding area where it will grow into a strong and healthy hair. Donor area sites usually heal within a week and go unnoticed due to the less then 1mm incision. HairPalace Hair Transplant Clinic only use the most cutting-edge solution – the FUE2 Safe System – which offers pain-free hair treatment, no visible scars, and authentically natural results.